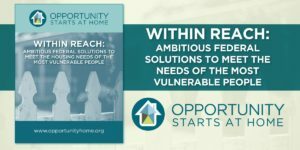 In an effort to continually advocate for the expansion of affordable housing throughout the nation, Housing on Merit has joined the Opportunity Starts at Home Campaign that includes national organizations working in housing, education, healthcare, civil rights, anti-poverty, senior advocacy, faith-based sectors, anti-hunger, veterans affairs and LGBTQ rights. 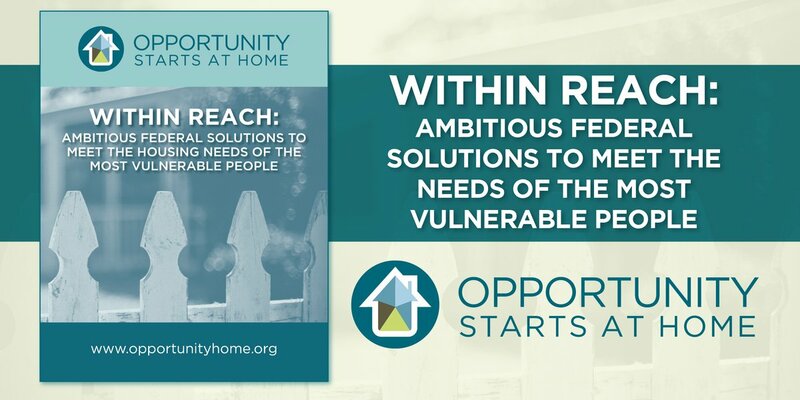 Recently, this multi-sector campaign released a report entitled “Within Reach” and is bringing it to Congress to advocate for stronger federal action and involvement for the most vulnerable low-income households. Included in the report are three long-term policy strategy initiatives to dramatically expand rental assistance, expand the supply of affordable housing, and prevent housing instability and homelessness through a national financial assistance emergency program. The report also presents research highlighting how housing can significantly affect outcomes in education, health, civil rights, food security and poverty reduction. The campaign is also pressuring Congress to increase the annual funding of the national Housing Trust Fund to $3.5 billion.